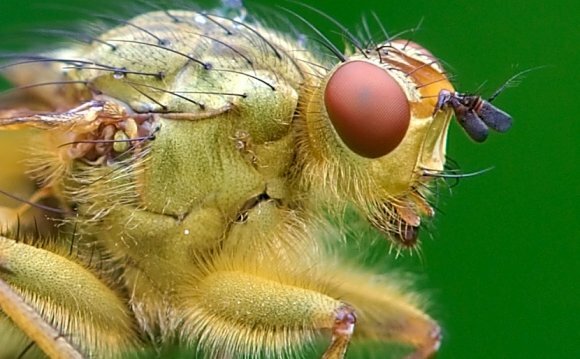 So how do you get close-up photos of subjects that are literally smaller than a grain of rice, let alone get those creepy crawlers to sit still long enough to take their photo? Straight from the expert, here are Alex’s 3 essentials for shooting macro photography. Especially because he does a lot of work placing insects on white backgrounds, knowledge and experience shooting with a flash has been critical. For most scenarios, the challenge is to get the light to be as soft and natural as possible, while still avoiding harsh shadows. “Actually, it’s really no different than putting together your typical fashion shoot on a white background, ” he laughs. First, Alex tapes a piece of your standard white printing paper to where the wall meets his table so that it forms a curve (keep in mind that his subjects are 5mm, not 5ft). Then he clamps his Canon speedlights to laboratory retort stands (which are inevitably always around his lab) for added height, and fits on diffusers that he makes himself with white plastic. Alex also keeps tinfoil and white card handy to create reflectors, helping bounce light back onto the subject to soften the shadows. Then Alex sets up his Canon 5D Mark II on a macro focusing rail with his go-to lenses – the Canon EF 100mm and Canon MP-E 65mm macro lenses. Many of the white background images are ready to go straight off the camera, although on occasion some post-production can help remove any small blemishes on the background and ensure that the image has a good contrast. “It’s a nice simple workflow if you get the flash power right, ” he says.